Hartlepool residents have encountered one of the most horrifying acts of animal defilement yet witnessed in this land. Contractors hurriedly painting double-yellow lines failed to dislodge the crushed remains of — and I struggle to write this — a hedgehog, instead choosing to entomb the unfortunate beast in their sickly daubings, The Guardian reports. 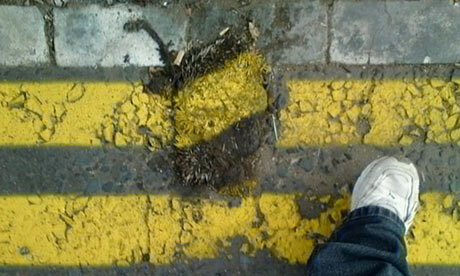 Mercifully, the incident was “the only one reported” to the council during the road painting scheme. Hartlepool has form with regard to the mistreatment of beasts; during the Napoleonic wars, the townsfolk hanged a monkey as one of Boney’s spies following a show trial on the beach. Police in Benin have shot and killed a chimpanzee that escaped from a zoo in the west African nation, Next News reports. Residents of Ogba, on the outskirt of Benin City were thrown into panic penultimate week when a chimpanzee allegedly escaped from its cage in the Ogba Zoological garden and attacked some fun seekers at the zoo. One of the “fun seekers”, Nwoke Chidozie, was forced to intervene when his “last son”, Divine, was attacked by the crazed primate. Chidozie half-nelsoned the hominin into submission, in all likelihood saving his son’s life in the process. Thanks to the intervention of Benin City’s finest, the animal does not, anymore, exist. Footage of a bear demonstrating extraordinary skill with the quarterstaff may be genuine, according to scientists, The Telegraph reports. Bekoff maintains that the bear’s skills are not natural — as if we needed to be told — and were probably developed in response to “extreme boredom”. But whether Claude’s technique was honed in anticipation of the hand-to-paw combat that is certain to greet his imminent escape attempt, or was conferred upon him by ambient radiation in the traditional style of 1950’s superheroes, remains to be seen. A monstrous rhinoceros escaped his pen at a zoo in Jacksonville, FL, The Florida Times-Union reports. Keepers attempted to lure Archie back to his enclosure with food, but to no avail. Eventually the prodigious perissodactyl was sedated and hauled back behind bars. At no time were the public in danger, since the brute remained contained behind a second fence. Rhinoceroses are not, of course, renowned for their cunning or dexterity. Neither were required for Archie to secure his freedom, since (surprise surprise) a keeper had left a gate open. Recent human concerns about the expansion of the surveillance state, to the extent that one’s every waking moment is observed by sinister officials peering at flickering CCTV screens, have been echoed by a lecturer in film studies at the UEA. Yet, somewhat surprisingly, Brett Mills is not concerned with privacy in the human realm. Instead, in a recent article for Continuum: the Journal of Media and Cultural Studies , Mills contends that BBC Bristol’s documentaries, including Nature’s Great Events , “use newer forms of technology to overcome species’ desire not to be seen,” and in so doing “deny many species the right to privacy”. “We have an assumption that humans have some right to privacy, so why do we not assume that for other species, particularly when they are engaging in behaviour that suggests they don’t want to be seen?” Mills rhetorically asks The Guardian . Your spiny correspondent has frequently speculated that houses are merely artificial caves, to which humans retreat for a bit of shelter from the elements, predators of various stripes, and prying eyes. Mills seems to ask the devastatingly obvious question of whether a beastly lair addresses not only the first two concerns, but also the third. “We can never really know if animals are giving consent, but they do often engage in forms of behaviour which suggest they’d rather not encounter humans,” Mills argues. So next time a beluga whale dives under the arctic ice, or a badger pegs it for the safety of his sett, the BBC should think twice before gleefully deploying some fiendishly clever invaso-probe to winkle Nature’s dank mysteries out into the glare of human scrutiny. Perhaps we can go one further than Mills. Unlike the denizens of human zoo Big Brother , this video of Javan rhinoceroses suggests the critically endangered mammals have no great love for the jungle paparazzi. “Natural history films play a major role in spreading knowledge of [scientists’] work. And understanding the world around is vital in the continuing endeavour to preserve our ecosystem,” they state. Ros Coward, writing in The Guardian , links Mills’ research with a further two studies that suggest chimpanzees mourn their dead in a recent article discussing the ascription of emotions to non-human animals. Coward longs “to see an end to claims of human superiority based on the belief that animals, even if they feel, do not have the ‘higher’ emotions of humans.” But she warns against “unscientific” interpretations of the chimpanzee funeral footage, preferring robust, falsifiable experiments. Happily, such studies exist: baboons show elevated levels of stress hormones and engage in more social grooming activities following the death of a close relative. But it does not necessarily follow that they are “grieving” in the human sense of the word. “If we assume animals have identical emotions to humans, perhaps we will insist on treating them as human. But until we know what animals really feel and what those feelings are, then treating them as identical to humans might be just as cruel as ignoring their feelings,” Coward writes. Of course “treating animals as human” would require that they be endowed with certain inalienable rights humanity cherishes for itself. Most people would probably concede that animals have some kind of right to an existence without unnecessary pain or suffering, even if those terms are not particularly well-defined. Others, of course, demand that animals have a right to life, without ever quite adequately explaining why, if animals are not meant to be eaten, they are nevertheless made of meat. Now Mills suggests that the beasts have a right to privacy. How long, we are forced to ask, before they are afforded the right to representation? Before this all gets out of hand, and we hear speeches in the House of Lords delivered in ultrasonic clicks, or we see faeces literally flung at the Prime Minister by Her Majesty’s Loyal Apeposition, humanity can reassure itself with the knowledge that, for the time being at least, dolphins still form pods, not political parties, and chimpanzees are organised in troupes, not trade unions.